American beavers are located throughout most of the United States and Canada except for parts of southwestern United States and parts of northern Canada. Beavers are almost always located near water sources such as streams, lakes and rivers. They will build "lodges" on the banks or shores of these water sources out of sticks, mud and other available materials. The lodges are built above water but may have several underwater entrances. The purpose of a beaver dam is to raise the water level around a lodge to the level needed for safety. Beavers will use these underwater entrances to enter and exit the lodges safely. Beavers will also create dams out of similar materials that they use to create the lodges. American beavers are herbivores, meaning that they will only eat plants or plant material. They like to feed on bark of trees such as maples and birches. They will also eat tree roots and aquatic vegetation. American beavers will grow to be from 2 - 4 feet in length. Adults will weight between 30 and 60 pounds. American beavers are the largest rodents in North America, and are among the largest rodents in the world. American beavers have thick, brown coats of fur which help to insulate and keep them warm. These coats allow the them to swim in very cold water. American beavers have two large incisors in their mouths that never stop growing throughout their entire life. They keep their teeth worn down by chewing on wood and other objects. American beavers are superbly designed for life in and near the water. Their tails are flat and can be used like fins to help beavers move through the water quickly. They also have webbed hind feet that help them move through the water. When a beaver dives underwater, its nose and ears will close up to block water from entering. They also have membranes that will cover their eyes so that they can see underwater. A female American beaver's gestation period (pregnancy) lasts between three to three and a half months. Their litter sizes average between 3 - 6 kits. Animals that prey on beavers include coyotes, mountain lions, lynx and foxes. 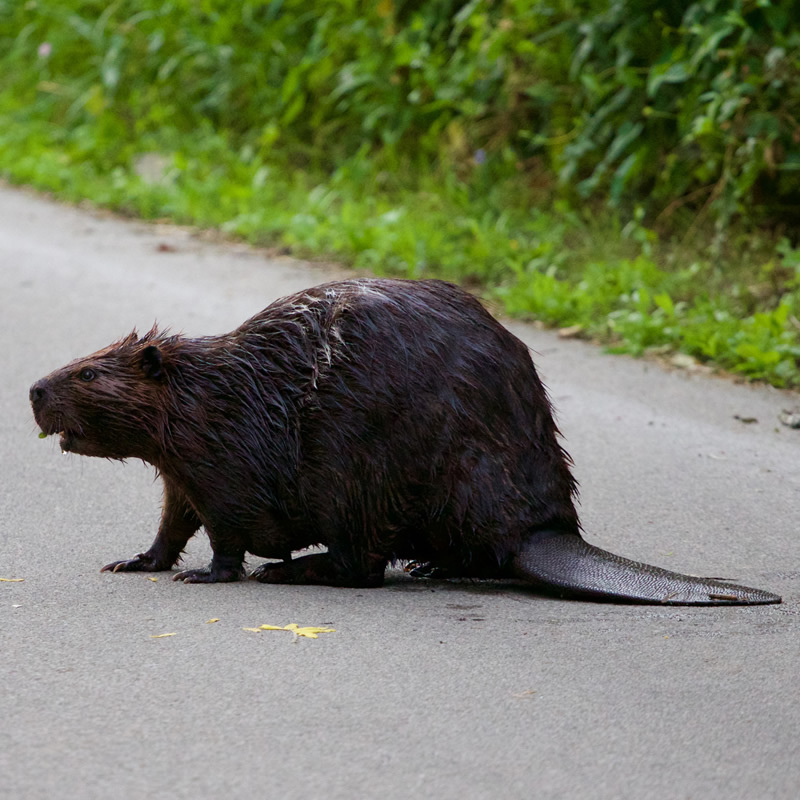 Large predatory birds like eagles and hawks may hunt smaller beavers. Beavers are the mascots of Oregon State University. Beaver pelt trading was a large economy of early American and Canadian settlers. It is the national animal of Canada.